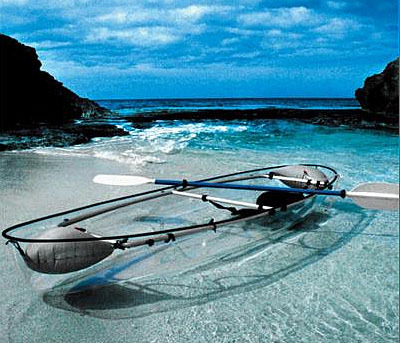 This transparent Canoe-Kayak offers the sort of harmony with nature only available from human-powered vehicles. The hull is made from a transparent polymer identical to that found in fighter-jet canopy's. So it's not going to shatter if you scrape a rock or two. As a further safety measure the Transparent Canoe-Kayak has two floatation devices, fore and aft, as well as a lightweight anodized aluminium frame. Adjustable seats accommodate people of all sizes, and a wide hull with a low seating position mean the Transparent Canoe-Kayak is relatively stable compared to similar sized canoes.